In every area in all districts in Bali, has a panoramic view which is different from one to another areas, some of it very famous as tourist attraction. Bali Island is part of the Lesser Sunda Islands along the 153 km and 112 km wide approximately 3.2 km from the island of Java. Astronomically, Bali is located at 8 ° 25'23 "south latitude and 115 ° 14'55" east longitude which makes tropical like other parts of Indonesia. Situated between Java and Lombok island. On the Bali island lie mountains that extends from west to east and in the mountains there are cluster of volcanoes : Mount Batur and Mount Agung, also non-volcanic mountains : Mount Merbuk, Mount Patas and Mount Seraya. The existence of these mountains cause the Geographic of Bali region is divided into two (2) unequal parts namely North Bali with a narrow lowland and less sloping. But South Bali with extensive lowland and ramps. Bali slope consists of flat land (0-2%) covering an area of ​​122,652 ha, undulating land (2-15%) covering an area of ​​118,339 ha, land is steep (15-40%) of ​​190 486 ha and area of ​​132 189 ha is very steep. 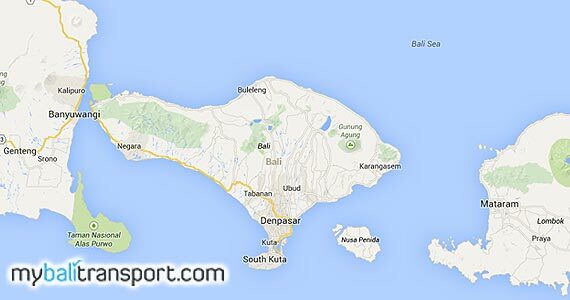 The total area of ​​Bali Province is 5636.66 km2 or 0.29% of total area of ​​the Republic of Indonesia. 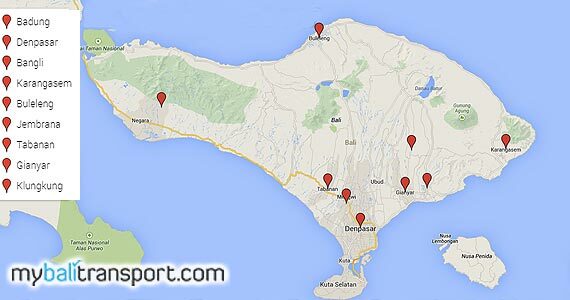 Bali Province is administratively divided into 8 Regencies, 1 City, 55 districts, and 701 villages. And there are a number of Banjar in each village. Important and interesting places in Bali that you should visit such as: Ubud as art center and luxury resort, located in Gianyar regency. Nusa Lembongan is as one of the dive (diving), located in Klungkung Regency. While Kuta, Seminyak, Jimbaran and Nusa Dua is located in Badung.